Convenient location close to waterfront cafes and main shopping district. Suites offer a gracious home-like atmosphere. Where to find Thessaloniki hotels near an airport? How can I find hotels in different Thessaloniki neighborhoods? Where can I find hotels in Thessaloniki that are near tourist attractions? If you are choosing where to spend the night while vacationing in Thessaloniki, there is a wide array of comfortable options to choose from. Expedia features 60 hotel and apartment options within 0.1 kilometres (0.06 miles) of Thessaloniki's center. Within 1 kilometre (0.6 miles) of downtown Thessaloniki, travelers can stay at some great hotels, such as the Daios Luxury Living and Makedonia Palace. 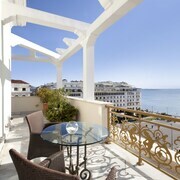 The Excelsior Hotel and the Electra Palace Thessaloniki are both conveniently close to Archaeological Museum. The Mediterranean Palace Hotel and the City Hotel Thessaloniki are near White Tower of Thessaloniki. The Arch of Galerius and the Saint Demetrios Church are two other famous Thessaloniki destinations. 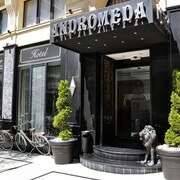 The Domotel Les Lazaristes and the Andromeda Hotel Thessaloniki are near to the Arch of Galerius. 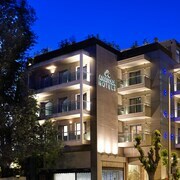 The Anatolia and the Holiday Inn Thessaloniki, are near the Saint Demetrios Church. At Expedia, we know that all travelers possess different vacation budgets. If you're looking for a room at the cheaper end of the range, thessaloniki area offers some solid options. The Telioni is 2 kilometres (1 mile) from the heart of Thessaloniki, while the Hotel Olympia Thessaloniki is 2 kilometres (1 mile) away. 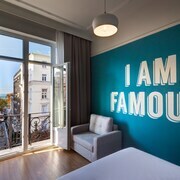 Other lower-cost room options include the Park Hotel and the Hotel Abc. 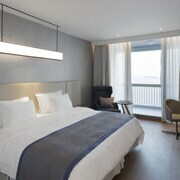 You could also check out the Hyatt Regency Thessaloniki as well as the Hotel Nikopolis. 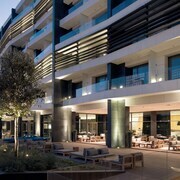 The Hyatt Regency Thessaloniki is 12 kilometres (8 miles) away from the middle of Thessaloniki. The Hotel Nikopolis, is positioned 9 kilometres (6 miles) away. Some other hotel and apartment options in the area include the The Met Hotel and the Porto Palace Hotel. Sithonia is 90 kilometres (57 miles) to the southeast of Thessaloniki and is home to the Porto Carras Beach and Porto Carras Winery. The Rania House Apartments and Hotel Petunia are a few of the Expedia-recommended apartment and hotel options in Sithonia. 65 kilometres (40 miles) to the east of Thessaloniki, is Asprovalta, home to the Pension Delfini and Villa Camellia. Should you choose to stay in Asprovalta, be sure to check out the Cave of Agios Georgios and Lihadonisia Diving Center. If you are traveling into or out of Macedonia Airport and are looking to stay nearby try Royal Hotel or Ambassador Hotel. What are the most popular Thessaloniki hotels? Are there hotels in other cities near Thessaloniki? What other types of accommodations are available in Thessaloniki? Explore Thessaloniki with Expedia.ca’s Travel Guides to find the best flights, cars, holiday packages and more!